When Trumbull High School senior Scott Denenberg joined the school's tennis team three years ago, he brought a wealth of experience and training seldom seen by coach Abe Breslow. Last year, Denenberg's skill translated into something never achieved by a Trumbull tennis player being named a National Tennis High School All-American. Denenberg, 17, was recognized as one of the top 40 high school players across the nation for his 15-0 season playing first singles last spring. He advanced to the state finals before losing a close three-set match, 2-1, to Todd Paul of Fairfield Prep. The high school senior said he was surprised to hear he was chosen for the prestigious award because he didn't play in the New England Championships this year. Nonetheless, he said he is honored by the achievement for himself and his town. Denenberg began playing tennis around 3-years-old and began playing in tournaments at 7-years-old. It was a wealth of experience that amazed coach Breslow when Denenberg joined the team his freshman year. 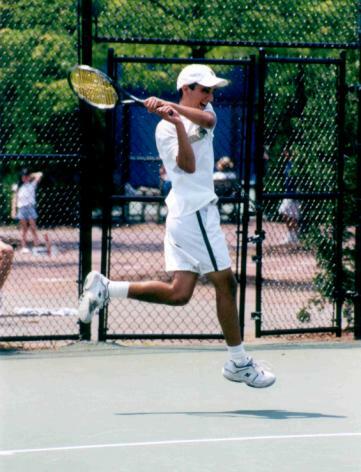 Denenberg progressed from second singles his freshman year to the premier spot on the team as a sophomore. "There was a tremendous improvement from his sophomore to junior year," Breslow said. "Denenberg showed a tremendous amount of determination practicing and playing in tournaments during the off season which gave him an advantage against opponents in the regular season. He has blossomed very nicely,"
Though the tennis program has been at Trumbull High for decades, Breslow said the program has always been on the edges of the upper echelon and therefore never produced an All-American until now. Breslow said that it is tough for tennis to compete with popular team sports like baseball and football because the sport is a very expensive and time consuming. "Initially, you have to love it and have a passion for it and Scott has that," he said. Though Denenberg has always been interested in tennis, his love for the sport was bolstered while training alongside current ATP player and former Fairfield High School standout James Blake at the Tennis Club of Trumbull. He said hearing of Blake's high school exploits inspired him to make a name for himself in tennis. While others may shy away from the intensity of tennis, Denenberg said he enjoys the pressure and the dedication needed to succeed. "It is an individualistic competition, there is no one to pass the ball to," Denenberg said. "It is all on my shoulders. The harder I push myself the more I succeed." Off the court, Denenberg also pushes himself in the classroom. He is one of the top students in his class and a National Honor Society member. Denenberg is also editor and chief of the school yearbook and a member of the math team, French club and the Program of Excellence community service club. Breslow said that Denenberg intellect is his main strength as a tennis player. "He is a very smart player," he said. "He is able to analyze things due to his brightness. He is good at reading his opponent and using that to his advantage." Currently ranked 171 in the nation, Denenberg said he is working to improve his ranking to help him get into an Ivy League school like Columbia or Yale. He also hopes to lead the team to a good season this year. Breslow believes that Denenberg's achievements will help improve the school's program for years to come by inspiring the town's youth to take up tennis. "It's certainly rewarding to have a person like Scott on the team," Breslow said. "I think it will be a boost for the town's youth to see, at an early age, that there is recognition for this sport."